Home Dehydrating is made easy with this comprehensive book packed with 270 pages of easy-to-follow steps for dehydrating foods. Drying food is a great way to create some of the tastiest and most convenient treats that your family will enjoy. 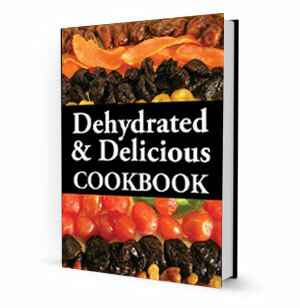 It includes over 125 recipes and is the complete book on dehydrating meats (including beef jerky), fruits, vegetables, herbs, flowers, yogurt and more. Dehydrated foods are also wonderful additions to your favorite recipes for casseroles, soups, stews, compotes, and sauces. This amazing cookbook truly is your Ultimate DIY Guide to Dehydrated Foods!